Robot A and Robot B must escape the dungeon boxes. The Purple Cyrstals rotate Robot B. The Green Cyrstals teleport Robot A and Robot B if they both pass through the Green Cyrstal. The Yellow Cyrstals can create objects. This game is creative commons attribution blah blah blah. You win if you hit the other person before they hit you. Game where two players play locally on one computer. 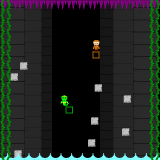 One player uses the keyboard to chase the second player, who is using a microphone to control their character. An arcade-type game inspired by NS-Shaft, and possibly Gunstar Heroes. As Fleetfoot Fuller, danger-face-laugher and gravity-obeyer extraordinaire, you must survive in the descending shaft of this perilous videogame temple! Drop from brick to brick, and keep your wits about you when gravity suddenly flips 90 degrees, sending you sideways! 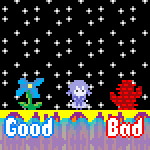 There are two game modes - a one-player game with two difficulties, and a rushed two-player game where you can challenge a friend to play Carly the Snake Woman and see if they can outlast you! And there's only room on each brick for one player, so it pays to be swift and reckless. Space - Switch gravity in two-player mode. Player 1 (left) uses W and S to move. Player 2 (right) uses arrows. Players must catch only the lowest-numbered ball on the field! Whoever claims the 9-ball correctly wins. Player 1's goal is to pocket the solid balls, whereas Player 2's goal is to pocket the striped balls. Catch the 8-ball after completing your goal to win.